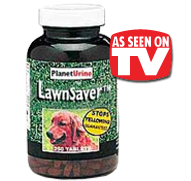 LawnSaver™ is a healthy dietary supplement that stops dog urine from yellowing your lawn. LawnSaver is beef flavored and your dog will love the taste. Imagine how Green your lawn can look. imply feed LawnSaver™ to your dog and rid your lawn of yellow spots. LawnSaver™ works on about 98% of dogs! 1. Water lawn heavily for two weeks to “rinse”. 2. Reseed lawn after feeding LawnSaver™ for two weeks. 3. Continue feeding LawnSaver™ daily. That should do the trick! Imagine how LawnSaver™ can repair your lawn as well as perhaps a relationship with a friendly neighbor! LawnSaver™ works with all natural amino acids and vitamins. The yucca contained in LawnSaver™ also helps to reduce stool odor. LawnSaver™ is a combination of b-complex vitamins, amino acids and biotin. This synergistic combination helps metabolize nutrients better and diminish yellow spots on the lawn. Dicalcium Phosphate, Maltodextrins, dl-Methionine, Thiamine Mononitrate, Pyridoxine Hydrochloride (B-6), Biotin, Vitamin B-12 Supplement, Yucca Schidigera Extract, Beef Liver, Montmorillonite, Processed Grain By-Products, Magnesium Stearate, Stearic Acid, and Silica Aerogel. Each tablet contains 133 mg. of dl-Methionine. “Our own testimony is with our female Black Lab. Following the instructions, we give her 4 tablets twice daily. She weighs 65 lbs. Our lawn is FINALLY ‘spot’ free! We love this product and our Lab LOVES to gobble down the tasty tablets.” Peter H.
LawnSaver™ is a healthy dietary supplement that stops dog urine from yellowing your lawn. LawnSaver is beef flavored and your dog will love the taste. LawnSaver™ works on about 98% of dogs!